Jeff Kay of Travelers Rest killed this big bear on Oct. 17 in Greenville County, SC. 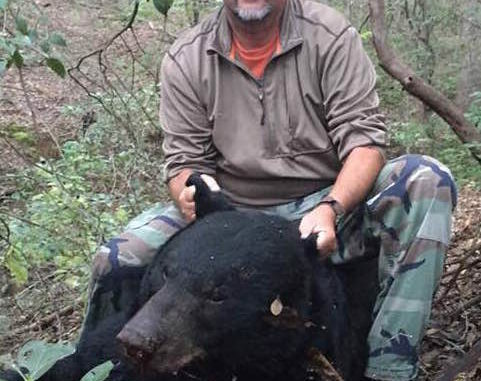 Jeff Kay of Travelers Rest, SC killed his first bear last Wednesday, Oct. 17 in Greenville County, and it was a whopper. The bear weighed 504 pounds. With cool and clear weather, it was a nice opening day for Upstate bear hunters. Kay has bear hunted in Greenville County for the past 9 years, and even though he has seen plenty of bear sign, he had never seen a bear while hunting until this year, and his encounter with this big bruin was a little bit unexpected after spotting a sow with two cubs earlier in the day. “I’d been doing some scouting in the area before the season opened, and I’d seen plenty of sign, so I knew bears were in the area, but everything I saw indicated it was multiple bears of various sizes. So when I saw the sow and cubs on the morning of opening day, I figured all the signs I’d been seeing were from them,” said Kay. The mother bear sent her cubs up a tree as soon as she spotted the hunter, and he decided that in the afternoon, he would hunt nearby on a different ridge. “After seeing those three, I prayed that God would let me see a different bear, and one that I could shoot. 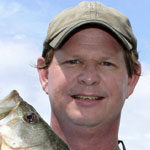 He did that, and I’m thankful for it,” he said. That move paid off. Sitting on the ground and looking slightly downhill on his second hunt of the day, Kay saw the 504-pounder not long after getting comfortable, and he had an available shot immediately. He pulled the trigger on his Winchester Model 70 7mm Mag, sending the 175-grain bullet 100 yards to his target. The bear ran a short distance before falling, and Kay put another bullet in the bruin, which finished the job. “Everybody says you should wait a while after shooting, but I waited about 20 seconds and couldn’t stand it any longer,” he said. And that’s when the real work began. Kay was parked about a mile away from the kill site, so he knew he couldn’t do it alone. He ran across Dustin Sherbert with the SCDNR, who tried helping him, but the bear was just too big. “The two of us tried pulling it out, but it was useless. We might have moved that bear three feet,” said Kay. So he called a friend, who unfortunately wasn’t able to come help. But, he was able to send some other friends to help out, and Kay said that’s the only thing that made dragging the bear out of the woods possible. “My buddy sent seven guys out to help me. We had a long drag — about three-quarters of a mile, and then Dennis (Sherbert) got his truck to that point, which saved us from having to drag the bear another 200 yards or so,” he said. Kay has decided to get a 3/4 mount of the bear from Chip Hamilton Taxidermy (864-304-9011) in Easley, and he got the meat processed. “I’ve given some of the meat away, and I’ve stocked my freezer with the rest. I feel blessed, and give all the credit to the Lord,” he said.